Today’s home theaters are much more then a room with a big screen TV and some speakers. Most have a large flat panel display displaying high definition video content, electronics, and speakers for the surround sound system. 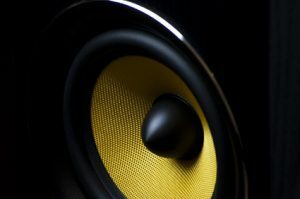 At the higher end, you have projection systems with screens of 100 inches or larger, leather seats with motorized recline, controllable lights, subwoofers with such deep bass they could rattle pictures off the wall, all controlled by a single button push from a touch screen remote. But even the most expensive gear is not necessarily going to give you the true movie experience. What you need is the proper design that integrates all the equipment with the theater space. 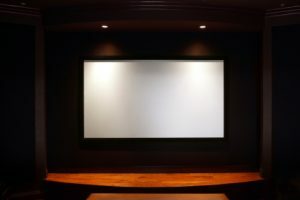 The goal of an EHT home theater design is to duplicate the movie-mixing studio environment in your home. The end result is to experience a movie as intended by the filmmaker. Every whisper to every car crash is how you were meant to watch and hear it. In addition, you become so immersed in the movie that you escape from reality. Who doesn’t need this in today’s hectic society? Make every seat a good seat in terms of sight and sound. Have you ever had to move seats at your local movie theater just so someone’s head was not in the way of viewing the screen? Every person should have good sight-lines to the screen and every person should all be hearing the same thing. Intelligible movie dialogue. When at your local movie theater, have you ever had to ask the person next to you “What did he say?” Or when at home, have you ever had to turn on the DVD subtitles just to understand what the characters are saying? Most would blame the movie/DVD but a stronger case can be made towards blaming the acoustics of your theater environment. EHT understands room acoustics and has the knowledge and tools to control them for the maximum movie experience. 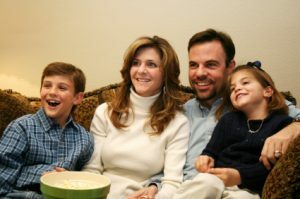 Watch a movie without waking up the kids (or vice-versa) or watch a movie without hearing the neighbor’s barking dog. Let’s say you wanted to watch an action move after the kids go to bed but their bedroom is directly above your theater space. Most would have to watch the movie at reduce volume levels thus diminishing the movie experience. Let’s say you are watching a dramatic quiet scene of a movie and all you hear is the neighbor’s barking dog. Again, you are pulled back into reality and the movie experience is lessened. 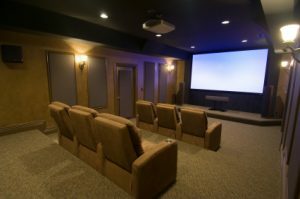 All these issues can be controlled by the construction of the room (prior to drywall installation) with the end result of dramatically enhancing the movie experience. The theater has the perfect balance of audio/video performance with room aesthetics while cognizant of the client’s needs and preferences. A theater can have incredible audio/video performance but how does it look with all the lights on? Are the speakers visible? Is the equipment visible with its array LED displays and lights? Does the theater’s decor match the homeowner’s taste? The theater should have both stunning aesthetics and performance. The theater is incredibly easy to operate. The control system is the heart and soul of the theater since this is the interface to running the show. The homeowner uses the control system to turn on the theater, select what to watch, change the volume, etc. A properly designed control system must be simple, easy to understand, and easy to use. Achieving such designs with all these traits is not an easy task but the staff at EHT have the training and experience to make it happen.